A Manhattan is a cocktail made with whiskey, sweet vermouth, and bitters. Commonly used whiskeys include rye (the traditional choice), Canadian whisky, bourbon, blended whiskey and Tennessee whiskey. Left: A classic 2:1 Manhattan, made with Canadian whisky, sweet vermouth, bitters and a cherry. Proportions of whiskey to vermouth vary, from a very sweet 1:1 ratio to a much drier 4:1 ratio, some people even enjoy a 10:1. The cocktail is often stirred with ice and strained into a cocktail glass, where it is garnished with a Maraschino cherry with a stem. A Manhattan is also frequently served on the rocks in an old-fashioned glass (lowball glass). The Manhattan has been called a drinking man's cocktail—strong, urbane, and simple. It has also been called the "king of cocktails." The Manhattan is subject to considerable variation and innovation, and is often a way for the best bartenders to show off their creativity. Some shake the ingredients with ice in a cocktail shaker instead of stirring it, creating a froth on the surface of the drink. Angostura are the classic bitters, but orange bitters, Peychaud's Bitters, and others may be used. Some make their own bitters and syrups, substitute comparable digestifs in place of vermouth, specialize in local or rare whiskeys, or use other exotic ingredients. A lemon peel may be used as garnish. Some add juice from the cherry jar or Maraschino liqueur to the cocktail for additional sweetness and color. Using more vermouth and less whiskey to create a milder Manhattan may actually make the drink taste stronger to some drinkers because of the intense flavor of sweet red vermouth. Some common variations on the classic Manhattan are given below. Stirred over ice, strained into a chilled cocktail glass, garnished with a cherry, and served straight up. A Brandy Manhattan is made with brandy rather than rye. A Ruby Manhattan is made with port rather than vermouth. 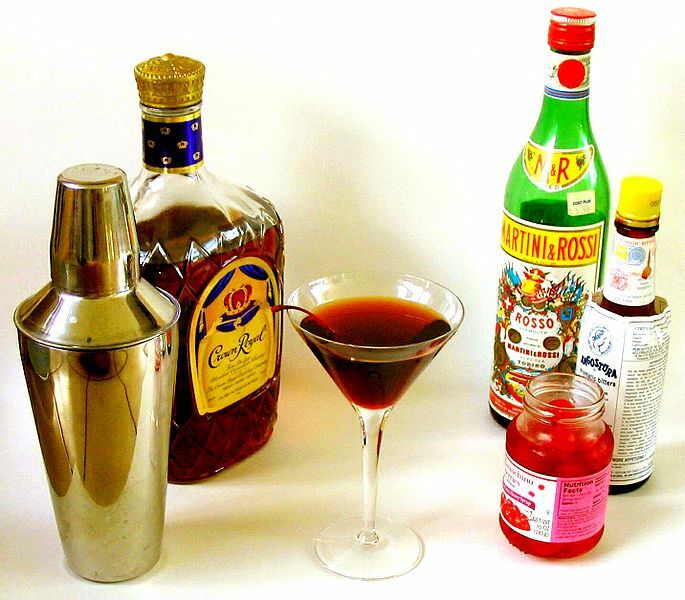 A Metropolitan is similar to a brandy manhattan, but with a 3-to-1 ratio of cognac or brandy to vermouth.